When was the last time anyone saw an exciting documentary about lawyers? Then I met director Brian Kelly (a former Discovery Channel executive); his enthusiasm for the “Injustice” message was so contagious I found myself looking forward to the review copy. “InJustice” takes viewers on a journey through the dark corridors of lawsuit scams and abuses, including fraudulent claims in asbestos and silicosis litigation, the Fen-Phen diet drug scandal, the mega-million dollar tobacco settlements; Wall Street power grabs, and shakedown operations in the aftermath of Hurricane Katrina. 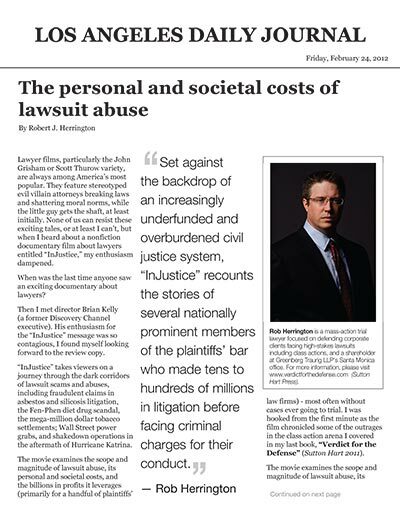 The movie examines the scope and magnitude of lawsuit abuse, its personal and societal costs, and the billions in profits it leverages (primarily for a handful of plaintiffs’ law firms) - most often without cases ever going to trial. I was hooked from the first minute as the film chronicled some of the outrages in the class action arena I covered in my last book, “Verdict for the Defense” (Sutton Hart 2011). The movie examines the scope and magnitude of lawsuit abuse, its personal and societal costs, and the billions in profits it leverages (primarily for a handful of plaintiffs’ law firms) -most often without cases ever going to trial. Kelly told me he was inspired to make the movie after seeing the constant barrage of television ads for lawyers hawking the latest class action or mass tort lawsuit. He was interested in how the lawsuit system had evolved over the last generation into a major force in our culture. Kelly explained he decided to make a film that would help people understand how the civil justice system actually operates, both the rules and the realities, and how the search for justice in this arena too often degenerates into a shakedown scheme enriching a few lawyers at the expense of everyone else. If you haven't seen the movie, it is well worth the time. The movie documents the growing abuses of a handful of opportunistic (and in some cases maniacally entrepreneurial) trial lawyers and reveals how their actions can abuse the court system, besmirch the legal profession's reputation and ignore the rights of individual victims involved in these massive lawsuits. Everyone should see it. In fact, the Daily Journal has arranged a complimentary online review copy for their readers for a limited time. “InJustice” is available for the next two weeks at http://www.threatsofinjustice.com/dailyjournal.